Introducing the new breakthrough Chillgard 5000 Refrigerant Leak Monitor from MSA, designed to meet environmental and building code requirements for mechanical rooms. It is now the industry’s most sensitive and selective device of its kind on the market today. 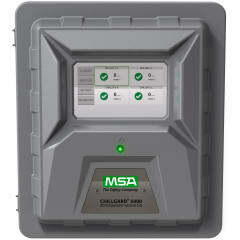 With the ability to read down to the 1 ppm level, MSA’s Chillgard 5000 provides an early response to HVAC refrigerant gas leaks, which allows maintenance crews to respond more quickly and to avoid the consequences and costs of hazardous gas leaks. Refrigerant gas is considered a toxic gas and although refrigerants have low toxicity, at high concentrations they can displace oxygen. Serious injury or death can result from worker oxygen deficiency. The Chillgard 5000 Leak Monitor can detect up to six different field-selectable refrigerants and be configured with a choice of 4, 8 or 16 sampling points. It features MSA’s photoacoustic infrared (PAIR) sensor technology, which is largely unaffected by temperature or humidity to reduce drift and increase accuracy – without frequent adjustment or maintenance. It has been independently third party tested to the 1 ppm level over temperatures of 32-122°F (0-50°C) and 0-95% relative humidity levels. In the event of a gas leak, the Chillgard 5000 provides a clear visual and audible signal to indicate there is a potentially dangerous, environmentally-harmful and expensive leak. Available gases include 20 of the industry’s most common refrigerants monitored over an operating range of 0 to 1000 ppm. Sensor response time at less than 90% of gas reading is under 70 seconds. Built-in diagnostics support predictive maintenance for worry-free use. With an all new intuitive user interface, the Chillgard 5000 features a large 7-inch (178 mm) touchscreen color display with real-time dashboard text and graphics. It is password protected for security, the text is viewable in six languages and its diagnostic and event logs make for easy inspection and maintenance. Calibration is completed at the touch of a button using the designated calibration port. The Chillgard 5000 is ideal for large building mechanical rooms, including those found in universities, banks, commercial offices, hotels, restaurants, strip malls, hospitals, nursing homes and places of worship. The automation friendly Chillgard 5000 operates independently or is compatible with multiple building management systems (BMS). The Chillgard 5000 includes integrated BACnet and Modbus for direct digital communication back to a centralized control system. BACnet protocol allows for non-intrusive gas concentration monitoring and alarm status. No configuration is necessary because the data is automatically mapped into the database upon protocol selection. The Chillgard 5000 is equipped with five internal relays for fault, three levels of alarm and an external horn option. Installation is simple requiring 24 VDC/VAC power. There are no moving parts for low maintenance and only an annual calibration check is recommended.